Alright, this is my personal blog, believe it or not. I try not to get too in your face personal, but today I’m going to. I’m a Penn Stater. A 2007 graduate of a branch campus in Erie, Pennsylvania: The Behrend College. I am a Delta Chi fraternity brother, I bleed Blue and White. When Joe Paterno lost his position at Penn State, after 61 years with the team, it was no doubt a shock. The man had been coaching at Penn State longer than I’d known what a university even was. When I was learning how to potty like a big boy, Joe Pa was taking Penn State to back-to-back undefeated regular seasons. Too many people used the cliched “evil triumphs when good men do nothing” tag-line in the weeks following the Penn State scandal. While I in no way wish to belittle what happened and what has come forth about Sandusky, but I have been livid since Joe Paterno was dismissed. Penn State asked him to step down from his position in 2004 amid poor performance, and Joe Paterno refused. To be ousted like this? Shameful. Mike McQueary allegedly witnesses Jerry Sandusky in the locker room with a young man. McQueary tells Paterno. Paterno tells his supervisors. Paterno loses his spot with the team before McQueary. Even if Paterno had gone to the police with what he had been told, at that point, it’s hearsay, inadmissable in court. Paterno had so little to do with the overall case – if and when this whole thing goes to court, Paterno would likely not even be able to be called as a witness! Yet there he was, the man literally bronzed into Penn State’s community, tossed from his position as Head Coach in the middle of the night. With nothing left to fight for or live for, Coach Paterno died from complications due to lung cancer a matter of weeks later. As a Penn Stater, it hurts. As a Penn Stater, I know a lot of oter Penn Staters. I have snipped just a few comments from friends’ social netorking pages, just to share with you how we feel. After all… We Are… Penn State. “No one deserves a million dollars just to coach a football team” -Joe Paterno after turning down a coaching offer from the New England Patriots in 1972. Mourning the loss of JoePa has nothing to do with being a Penn State fan, its about celebrating the life of a man that didn’t have a selfish bone in his body. Rest in peace coach, the world has lost a true gentleman. Wore my white long sleeve “400 wins” T all day and a PSU ball cap (thanks to the rain)…. while at the grocery store, almost everyone I made eye contact with gave me this look that simply said “I’m sorry” – complete strangers… the cashier asked me some details on his death and shared his sorrow and anger over how his career and life had to end. 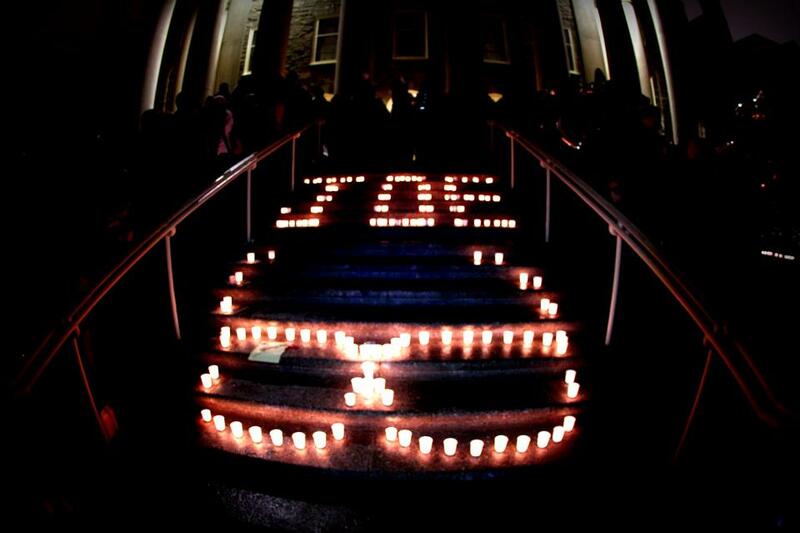 Joe just brings people together: Penn Staters and Non-Penn Staters alike. Penn State Behrend’s flag was at half mass today in honor of Coach. -Adam W., quoting an article featuring Scott Paterno’s words. I don’t want to talk about it. And if you’re from Penn State, you already know what I mean. -Me, minutes after official sources broke the news of Paterno’s passing.